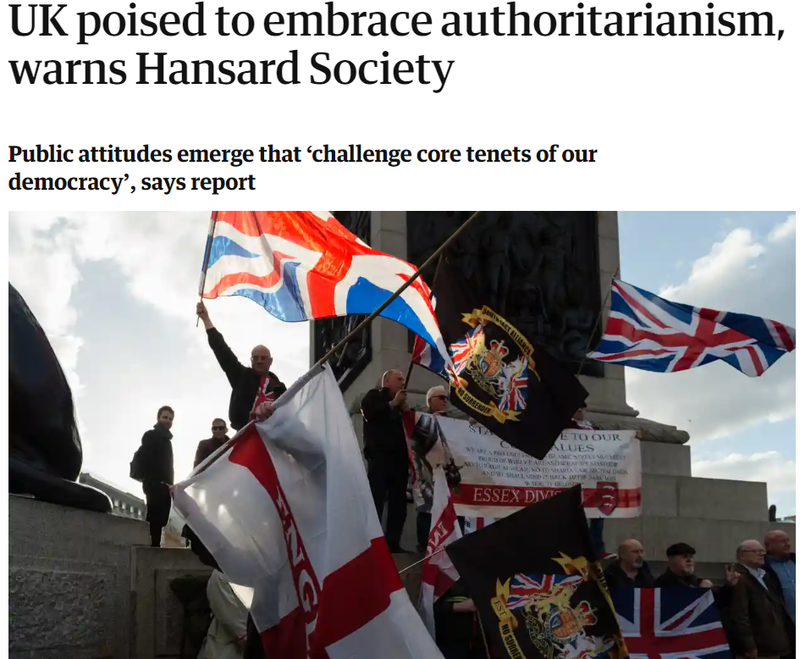 “UK poised to embrace authoritarianism” says the Guardian. 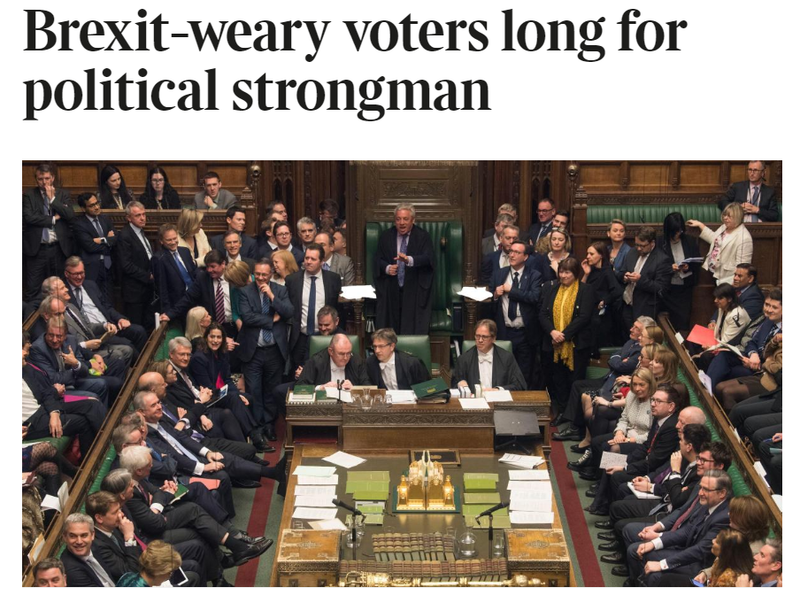 “Brexit-weary voters long for political strongman” says the Times. What’s happening? Has some British Mussolini set out on his March on London? Are fascist mobs storming the corridors of power, demanding the system be overthrown? Are tanks being readied while the radio stations prepare their playlists of martial music? Or has the Hansard Society done a survey? 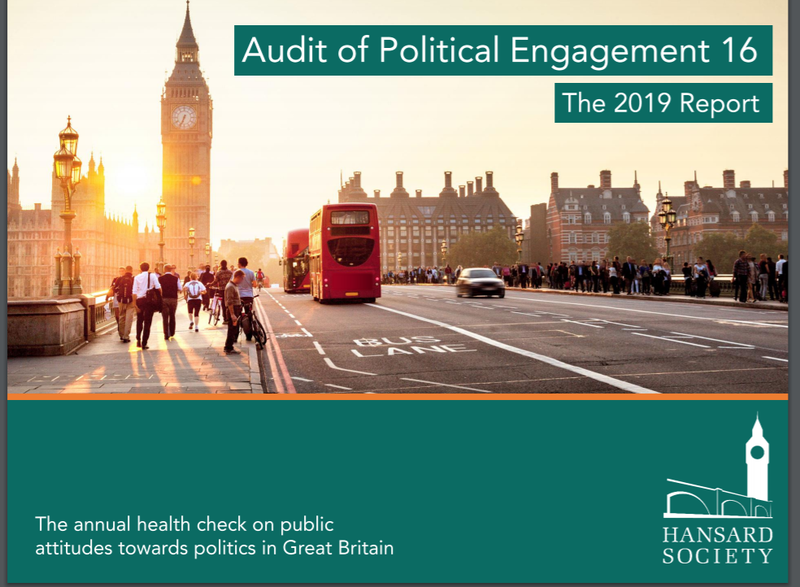 You probably won’t be surprised to learn that it’s the latter as they’ve released the latest version of their Audit of Political Engagement. 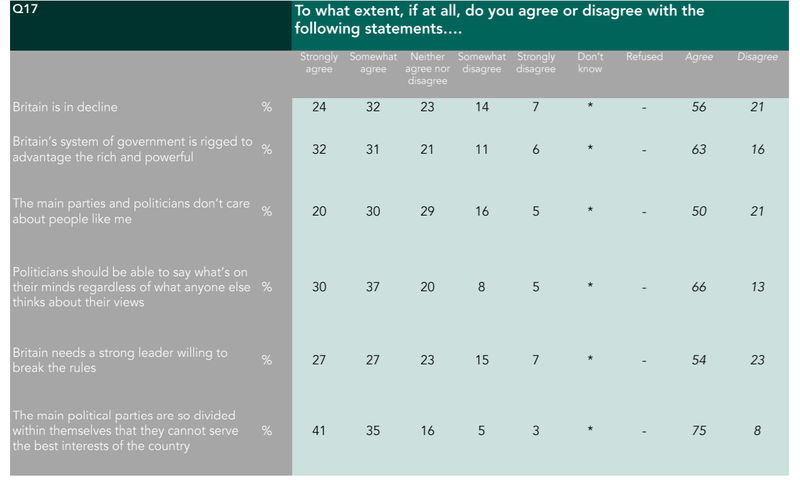 This is a regular survey the Hansard Society carry out to look at people’s views of the political system, how they engage with it, and whether they think it’s working (the full report is here and the data tables are also available from the Hansard Society). The fifth question of that group asks their opinion on the statement “Britain needs a strong leader willing to break the rules”. 27% strongly agree, 27% agree somewhat, 23% neither agree or disagree, 15% disagree somewhat, 7% disagree strongly. In crude terms, that 54% who want a strong leader, 23% who don’t and cue the gasps of surprise that everyone in Britain has suddenly gone fascist. One problem we have here is that this appears to be the first time the Hansard Society have asked this particular set of questions. Other items in the Audit have been asked in previous years, thus giving us a perspective on whether support for something is rising or falling (for instance, while 55% of people think referendums are a good idea, that’s significantly down from before 2016) so we can’t see how much support for “strong leaders” is similar or different to the way people have thought about the issue before. However, on the wider issue, I’m not convinced that the results of the survey mean we’re days away from a widely-supported fascist turn in the UK. (Well, no more than the already horrific swing towards normalising the far right and their arguments) There’s two main reasons for this, one about the nature of the survey and the way it was structured, the second about the way the idea of a “strong leader” who can sort out all our problems has been normalised in British political discourse. First, one key lesson in designing opinion polls and surveys is that the wording and structure of the poll itself is important. As I noted before, the strong leader question is part of question 17 of 19, after respondents have already been asked a bunch of questions about their experience of politics and government, their opinion on if the current system is working, and what they think about politicians. Right before getting to the strong leader question they’ve been asked if they agree that Britain is in decline, if the system of government is rigged and if parties and politicians don’t care about them. Unsurprisingly, reminding people that “the rules” aren’t working for them is a good way to get them to agree that someone who’ll break them is a good thing. This takes us into the wider issue about the normalisation of the “strong leader” in British political discourse. There’s been a gradual transformation since the 1980s, but particularly over the last couple of decades, in the structures of a lot of British government, particularly at lower levels. Local government especially has been cajoled into taking new more streamlined and “efficient” structures like mayors and police and crime commissioners with the idea that having a single person in control is somehow both more efficient and accountable. Even those local authorities that don’t have mayors have been encouraged (and some even ordered) to take on a “strong leader” model. Combined authorities were created on the explicit proviso that they had to be run by an elected mayor with the narrative behind them being that having one person in charge would make things happen and that they could break out of the old way of doing things. Meanwhile, central government appoints “tsars” to take charge of certain areas and valorises individual business figures and empowers them to recommend changes to government. And all of this comes to a wider background of praise for the power of management and dynamic leaders who change companies single-handedly. In the face of this sort of narrative, are we really that surprised that people think a “strong leader” will sort out all the problems? (And we should also remember that most people answering this survey will have clear and recent memories of a time when “strong government” was the norm) Our political system and discourse are based on the idea that individuals, not systems or institutions, are most important and getting the right person in the right position will change everything. It’s present on all sides: there are those on the right who want a British Trump, the Left think Corbyn is the solution, and even those in the centre hope for a British Macron or Trudeau to make everything better. So the lesson of this survey isn’t that Britain is making sudden and completely unexpected and unexplained lurches towards authoritarianism, it’s that we’ve always had systems that flirt with the authoritarian and see nothing wrong with centralising power in individuals. For all our talk of Parliamentary democracy, we’re very comfortable with the idea of power not being shared and giving those individuals the ability to set and change the rules as they see fit. When the system appears to be broken, we shouldn’t be surprised that people think the way to fix it is getting a dynamic individual in to do it, because that, in their minds, is what worked before. Many, many things. PhD student at QMUL. Running the 2019 London Marathon for Brain Research UK. @nickjbarlow on Twitter.